Our wallets are often stuffed with multiple credit, debit, loyalty and sometimes even gift cards. All these plastic cards take up considerable space in the wallet, and it’s not always convenient to carry them around. Leaving them at home might not be a feasible option too – you never know when you need them. This is a well established problem, with many solutions already available in the market today. However, most of these solutions rely primarily on contactless payments. You save your card information on your smartphone, head out to a supported merchant outlet and make your payment via barcode, NFC or any other contactless medium. Apple Pay and Android Pay are good examples of such solutions. But there’s one downside to these solutions, and that is compatibility. Most of the third world countries still haven’t been introduced to NFC based payments, and often still rely on legacy plastic cards with magnetic stripes. What if there was a plastic card that could replace all the cards that you carry in your wallet, and yet support all legacy card readers, including regular ATMs? Well, there is one available right now. And no, there’s no typo in the title of this article. It’s just what the product is called. The Plastc Card looks like a regular debit or credit card unless you see it more closely. It has a 3.1 inch E Ink touchscreen display, a rewritable magnetic stripe, a rewritable EMV chip, rewritable NFC and flash storage. All the technology combines together to give you a seamless payment experience. 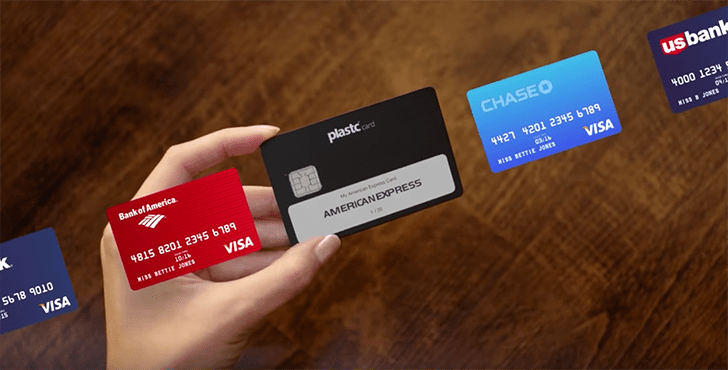 Plastc can hold information about up to 20 debit, credit, loyalty and gift cards, and at any point of time you can temporarily transform itself into the card of your choice. The rewritable magnetic stripe and EMV chip is updated with the information from the selected card, and you can walk into any merchant outlet supporting regular magnetic stripe or EMV chip cards, to perform transactions using the Plastic card. Heck, you can even walk into an ATM and withdraw cash from any of your bank accounts using the card. It’s literally the one card to rule them all! Accepted Everywhere: Plastc Card has its own re-programmable magnetic stripe, and can be used like a traditional payment card. But it also includes support for new payment technologies such as EMV and NFC contactless payments. Additionally, Plastc’s Wallet smartphone app also supports barcode, QR code cards. Security: A 4 digit PIN is required whenever changes are made to the card or to unlock the card, ensuring that no one can use your Plastc Card without your consent. You can even protect the Wallet app on your smartphone with passcode or fingerprint. Proximity Alert: You can pair up your Plastc Card with your smartphone via Bluetooth to sync Wallet information between the two and enable certain remote operations. For instance, if you leave behind your Plastc Card, your smartphone will automatically remind you once the card and phone are 100 feet apart. Remote Wipe: If your Plastc Card ever gets lost or stolen, you can use the Remote Wipe feature that will erase all the information stored on the card. It has the option to automatically erase all the information stored on the card, if it remains disconnected from your smartphone for a certain period of time. Once you get back the card, you can pair it up with your phone again and sync all the payment information from Plastc’s Wallet app. Emergency Card Mode: Plastc Card is powered by a rechargeable battery that lasts about a month. But in the instance that it loses power, you can set it (via the Plastc Wallet app) to automatically default to one of your cards to temporarily prolong usage. Lock Mode: Before you hand over your card to a merchant, you can lock it to a chosen card. In Lock Mode, only the last 4 digits of the selected payment card would be displayed, and the magnetic stripe along with the EMV chip will only hold that card’s information. The merchant would not be able to access any other information stored on the device. To unlock your Plastc Card, you need to enter the 4 digit PIN number. You can Pre-order Plastc Card from the official website for a discounted price of $155 right now (Original Price is $180). This discounted price includes a free lifetime subscription to Plastc Services (worth $50/year) and a Two-Year extended warranty. In the box, you get your own Plastc Card, a proprietary charger and a card reader. The Plastc Wallet app will be available for iOS and Android devices on their respective app stores at the time of launch. Though there is no official announcement on the launch date, Plastc is expected to release pretty soon.